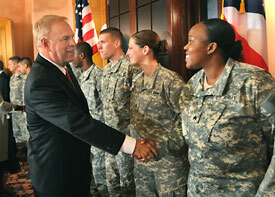 Governor Ted Strickland of Ohio signed an executive order that will allow all GI Bill recipients (MGIB)–their spouses and children as well–to attend any college or university in the state at an in-state tuition rate, no matter which state the GI Bill recipient lives in or comes from. It has been a good year for GI Bill recipients. Last month, Congress passed a new GI Bill, which doubled college benefits for veterans. And after some hesitation, President George W. Bush signed the Bill, originally thinking that the Bill would discourage soldiers from seeking long-term careers in the military. The Ohio Board of Regents will work with the American Council on Education to certify all Ohio colleges and universities as “servicemember opportunity colleges,” which will allow all college credits received in the military to be approved to transfer to every college or university in the state. The Board of Regents will also propose and support legislation that will allow Ohio National Guard scholarships to be used for graduate study, with things like housing, books, supplies and transportation. Currently, the scholarships may only be used for tuition and fees. The state has established a hotline (1-877-VETS-OH-1) and a Web site, http://universitysystem.ohio.gov/, to provide resources for veterans. Ohio has an estimated population of 11.5 million (277.3 persons per square mile–2000 sq. miles total) according to a 2006 U.S. Census fact sheet. The demographics include 84.9 percent white, 12 percent black, 2.3 percent Hispanic or of Latino origin and 1.5 percent Asian. Eighty-three percent of Ohio residents graduated from high school and 21 percent, ages 25 years of age and older, has a bachelor’s degree. The median household income was just over $40k in 2002 and the median home value was $113,072, although the mortgage crisis has affected Ohio since. Even before the economic downturn, the state has had its fair share of financial problems. In the early 80s, the unemployment rate climbed to 14 percent, falling to 6.9 percent in the 90s, even though GM auto plants laid off 178,000 workers. As of 2003, the unemployment rate was 6.2 percent, in sync with the national average. The winters in Ohio are cold and the summers are mild. Most of the rainfall occurs between the months of May through October. Cleveland, Ohio is the windiest city, averaging 11 mph, since it’s close to Lake Erie. For family fun, the state of Ohio houses the Cincinnati Fire Museum, about the history of firefighting in the city, the Cincinnati Zoo and Botanical Garden, the Children’s Museum and King’s Island, a family theme park. For performing art lovers, Ohio offers an opera and symphony–let’s not forget the Cincinnati Reds who gave away free baseball tickets on the Fourth of July to active-duty members of the military. Military veterans are no strangers to the area; over one-million vets were said to be living in the state according to the 2000 Census. And in 2002, nearly 7,000, active-duty military personnel were stationed near Dayton at Wright-Patterson Air Force Base. That’s not all; Ohio has been home to numerous famous inhabitants: U.S. President Ulysses S. Grant, Dean Martin, Dorothy Dandridge, Paul Newman, Doris Day, Steven Spielberg and Gloria Steinem, to name a few.